Just wanted to share these snaps of the sky last evening, just as the sun was setting I looked out and noticed how unusual the sky looked. 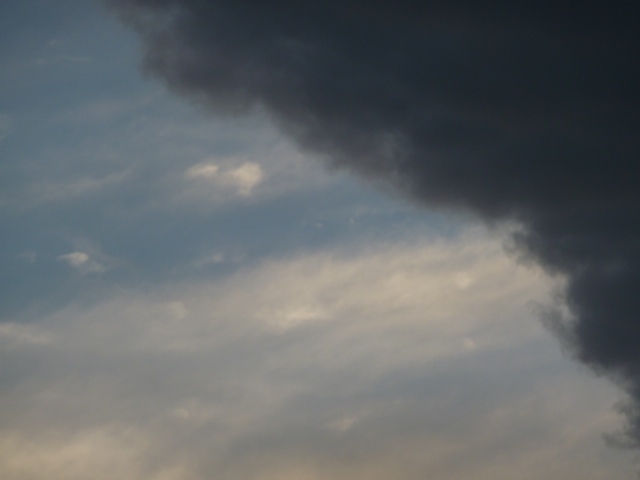 Grabbed my camera and took some snaps – not meant to be great photography but an interesting spectacle! 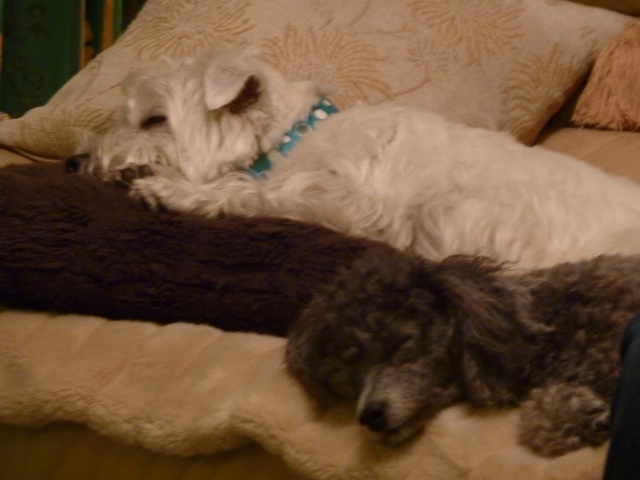 We now have two dogs, Izzie and Ruby. They provide us with endless love, joy and companionship. Ruby, who is just one year old is a west highland white terrier. 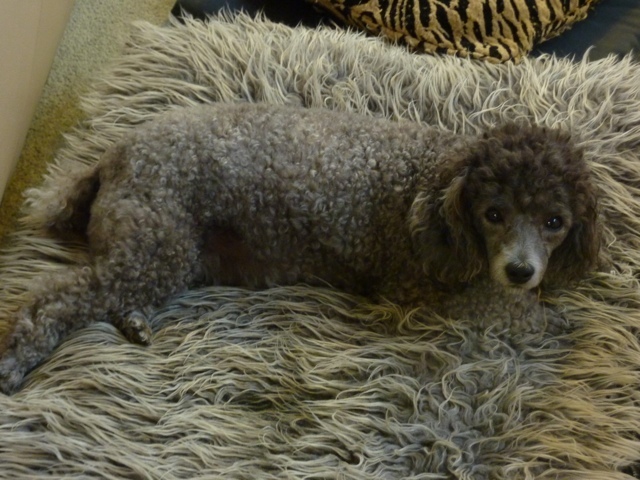 Her elder sister, Izzie, is two years old, she is a silver toy poodle. We have been loved by many dogs since we married. Tiffen, a corgi, was our first, followed by a long haired dash hound /corgi cross. Heidi lived with us through a move from one city to another and was a constant companion for 16 years. We used to live in a semi-detached town house and we were puzzled as to why Heidi was putting on weight as we carefully watched her diet. One day we watched as she quietly went down the stairs, out the front door, around the side of the house and into the attached town house. There lived a gentle spaniel who kindly allowed Heidi to visit and eat his dinner! Cheeky was his name and we often looked after him while his owner went on holiday. Heidi left us for doggie heaven and we were dog less for a couple of years when one day a colleague at work informed me that she wanted us to have one of her golden lab puppies as a pet for our children. This was Cindy, who became a much loved friend of our children in their teenage years. She spent many happy hours with them at the local high school and was joined briefly by a German shepherd, Maia. Sadly Maia was injured and was put to sleep at a young age. We brought in an adult shepherd as a companion for Cindy, as the children were now at varsity etc, and we thought she was lonely. This was not successful and sadly we had to return her (she was a rescue dog). Cindy continued as our only dog until she was about 13 when I fell in love with a black scruffy bundle of fluff at the local pet shop. 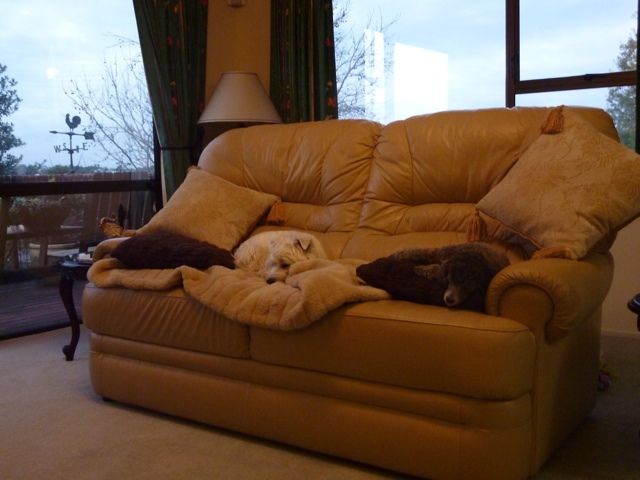 Bilbo came to live with Cindy and our Birman cats, he grew into a handsome miniature poodle who worshipped Cindy. Cindy started to slow down and grew tired of Bilbo’s constant attention so we bought a standard schnauzer puppy, Pippin. She and Bilbo became great friends and eventually at 16 years Cindy passed away. Bilbo and Pippin welcomed our grandchildren. Number one grandson, master L, was Bilbo’s favourite, he watched L as he learned to sit, crawl and finally walk. Pippin was just there all the time, quietly watching but never really engaging with the grandchildren. Bilbo was always there when Poppa bathed the grandees, placing his head over the edge of the bath, always, always right there beside them – such a fantastic loving dog. When I became unwell and had to have a lump removed he lay on my bed and never left my side until I was up and about the house again. Pippin and Bilbo started to age and then Bilbo became unwell, visits to vet were frequent but the prognosis was good when suddenly his condition deteriorated and he left us. We were devastated, he had been a very special and loving dog. Pippin was an only dog for about 9 months when I came across a toy poodle puppy in a pet shop. I liked her immediately, but, we were going overseas for 5 weeks so decided not to purchase her. On the day we arrived home I went back to the pet shop, she was still there, all alone. We called her Izzie, she just worshipped Pippin. Of course Pippin at 13 was slowing down a bit, she had arthritis but she was a strong dog and we loved her independent spirit. She was kind and patient with the little Izzie, a gentle giant and Izzie followed her everywhere. 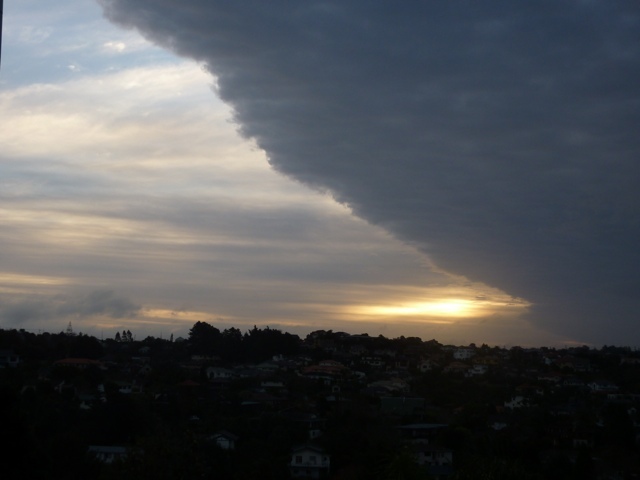 In September 2010 there was a large earthquake in Christchurch. This was a week after we returned from 2 weeks on the Sunshine Coast, and where upon our return the family advised that Pippin had not seemed her usual self while we were away. On the afternoon of the earthquake Pippin collapsed and we rushed her to the emergency vet, the news was bad, she was dying and within an hour had passed away. We were so sad but the little Izzie was lost, she wandered around the house, going from room to room looking for Pippin. After two days of this I decided we had to get her a small companion as soon as possible. I searched Trade Me, we missed out on a poodle pup by hours, and went to all the pet shops but no suitable pups for Izzie. A pet shop owner rang, they had received a shipment of pups from Christchurch, flown in that afternoon because the shop was damaged in the earthquake. 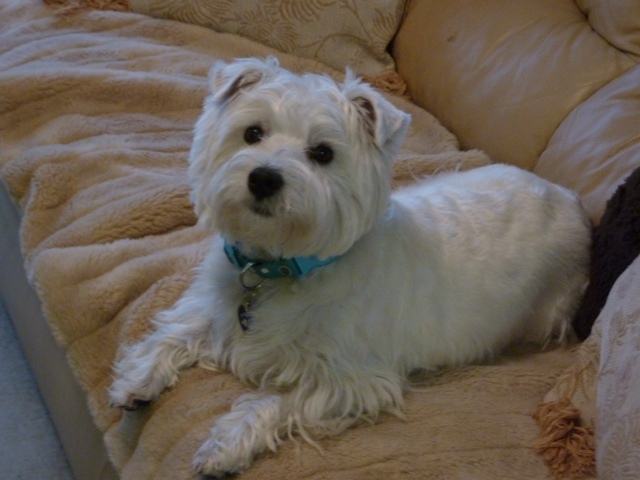 She believed that a 12 week old westie was just what we need for Izzie to have as a companion. AND this was how Ruby, who is one year old today, joined our family. We have found owning a terrier a little more challenging than our other dogs. But we love her and, more importantly, she and Izzie are great friends who sit beside me on the sofa as I blog! So three days off work -looking forward to walking the dogs, undertaking a little gardening and generally relaxing. 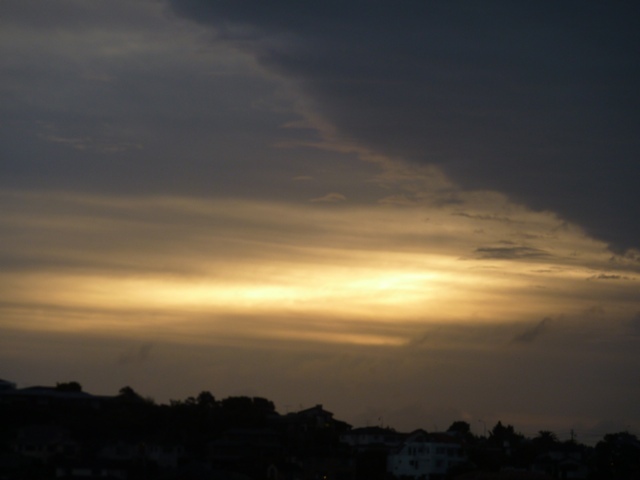 No so – well yes we did walk the dogs this morning, it was damp and very windy but we did not get wet. Later we drove down to the “village” for a coffee, by this time not only was it very windy but also very wet. In and out of the car, in and out of shops, wet, windy and uncomfortable. 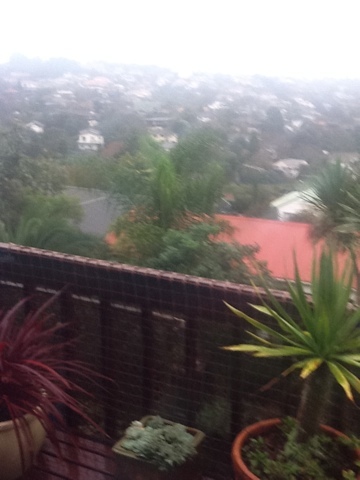 I am sure that it was wetter elsewhere in NZ but that did not make me feel better. The dogs and I spent a lazy afternoon indoors but the good news was that I took some snaps of the dogs (for another blog) and managed to download the photos from my camera to my iPad. I want to get the hang of this prior to our cruise late this year. It was wet and windy all afternoon. The husband wrapped up and drove away to watch P play football – he was home early – no staying after the game for a chat today. After dinner the Ruby wanted out for the toilet and, is her want, soon started barking at shadows. Oh yes, now I can try out those new spotlights the sparkie installed yesterday outside the laundry door. Oh they are great, I can see the whole side garden, wow, BUT there is something different. What is it? Oh no a large spiky plant, tall as a tree, only flowering once, has blown over. Last year it housed a bumble bee nest! We have been waiting years for this to flower. Husband thinks he can rescue – let’s see what the morning brings. 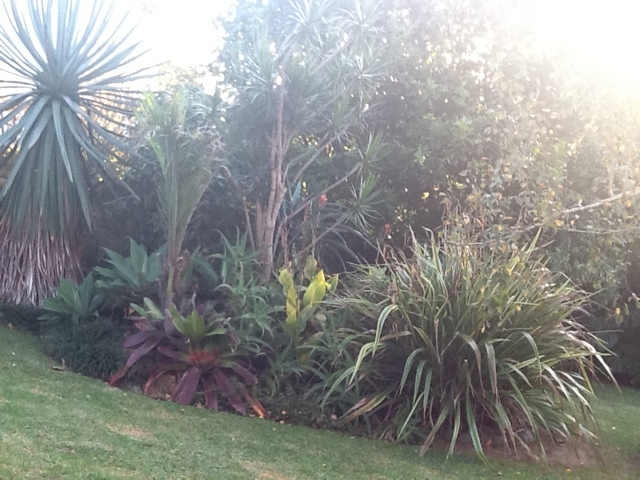 I will have to take a photo to add to this blog…….in this old photo it is the plant on the left – damn! Update – unable to rescue, far too heavy for us to lift together. Husband has been two hours chopping and cutting and son P is coming over with grandchildren this afternoon so he will help us get rid of the remnants – such a shame. It also did a lot of damage to the other plants around it, one of which will also have to come out – hope the rest will recover. AND it is very sunny and warm in Auckland today – such a city of contrasts!